Below are 5 advantages to having these portable, functional, architectural movable system based solutions. 1) Modular offices are less costly: Conventional office space designs are rigid and immovable with hard steel studs and drywall constructions, but these prefabricated in plant offices have movable walls, all designed in a secure and controlled environment. These systems can easily be installed in few days, compared to the traditional office furniture. Modular inplant offices by Panel Built use a built-out phased approach that does not require a lot of labour and is easily installed in any office space. These systems are quicker and more efficient. Panel Built modular office is less costly than the rest and the designs are offered with customizations with the ability to repurpose and relocate. Analysis and studies show that cost per foot (CPF) comparisons between drywall and stud and movable walls differentiate upon the design and the class used. Hence, in plant offices are less costly and more practical with great usage of space. Modular offices help businesses save a lot on an estate in the long run due to the efficient use of space and maximizing or reducing the square foot needed in a performance oriented space design. 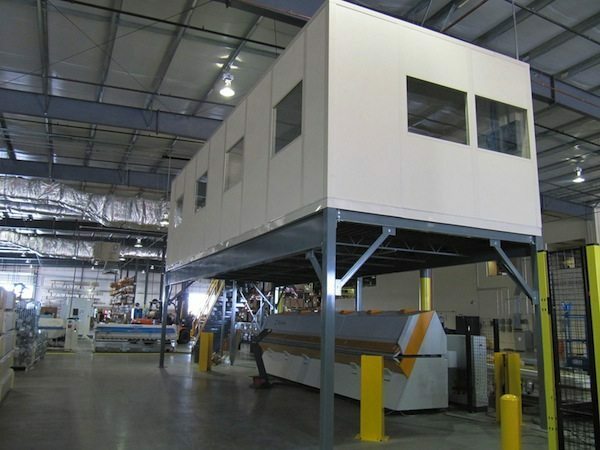 2) Quick & Easy installation of Modular inplant offices by Panel Built: The phased approach to installation along with the speed of delivery, reduces construction time by thousand fold. The speed with which these modular inplant office systems are installed makes them unique and above all they do not affect the office environment. Modular elements of the design take less time for reconfiguration and customization according to evolving needs of the office. The installation is quick and easy as the office walls are pre-glazed, pre-finished and equipped with electrical fittings so they can be fixed one after another with other construction activities executed simultaneously, thus reducing the construction time by folds. 3) Panel Built modular offices offer Environmental benefits and sustainability: Movable walls use material that improves the quality of air for employees along with the creative and practical use of the office space that limits waste. Modular walls do not use a lot of material which c the environment and reduces waste. The modular office is made out of recyclable materials and can even be reused. Installation is quick and dust-free for such systems, hence it improves air quality and flow. Modular office systems allow for incorporation of environment friendly applications to the design, including the use of natural building materials which are safe, energy-efficient and easy on the environment. Space design is sustainable and made up of durable material for longevity, hence reducing the material waste at each stage – from reconfiguration to construction. 4) Modular inplant offices by Panel Built are flexible to future industry design changes: Modular in plant office systems are flexible and can be easily changed to adapt new technology or even to reconfigure aesthetics to interior space design. The space can be easily changed to meet unique layouts as per need and these systems can easily fit the new office space. Some strong walls offer cavities, providing space for power plug, plumbing and incorporation of new technology. The cavities can easily be upgraded with new technology without changing the actual structure, hence making in plant offices a practical choice. 5) Modular inplant offices enhance productivity & encourage business innovation: In plant offices are flexible systems that help adapt to the ever changing work environment which is technologically driven. Creative modular office rooms enhances team productivity, greater employee retention as well as a possible employee attraction. The systems allow the opportunity to change the space as per function and work requirements for greater efficiency. An individual’s productivity in a work setting depends on group collaboration and modular offices expand the possibilities of using space in a more efficient manner. Furniture plays a major role in supporting a strategy used by a business, while also reducing employee occupancy costs. In the new day and age, with everything just a click away on the internet, cheap panel built in plant offices available online have made office space construction easier, faster, and accessible and taken it to a whole new level. Information flow in offices is more horizontal than vertical and space designs must adapt to it, considering the fact the lesser the hierarchical structure and design the more effective and productive the employees. Modular in plant office systems enable efficient transfer of information between employees, encouraging competition and regular feedback. In plant offices are innovative and support rapid sharing of information and ideas that can give birth to the next big idea to the market. Corporate relocations and reconfigurations are situations that bring opportunities learn and take lessons from the past for the facility managers. Panel Built, a leading office space design and system management company introduced unique and cheap modular in plant offices, two story in-plant office(s), three story in-plant office(s), multi-story inplant office(s) and prefab modular office building. The business world today is more dynamic than before hence flexibility is key. Large businesses have enough resources and leverage, but smaller and medium-sized businesses need a smarter and less costly approach to office space design which helps them to diversify as per need. Such business need flexible solutions that enhance the capabilities of employees and allows them to reconfigure the layout of their offices as they evolve. We at Panel Built believe in providing these space solutions to our customers. Where to find inplant offices online? Panel built understands the need of offices to be able to easily order their modular in plant offices online at lesser prices and installation with a quick response time. Cheap panel built in plant offices available online via Panel built are an effective and reliable source of flexible office space design solutions.